Q 1. Are there aspects of surface temperature measurement procedures that potentially impair data quality or introduce bias and need to be critically re-examined? Q 2. How widespread is the practice of adjusting original temperature records? What fraction of modern temperature data, as presented by HadCRUT/GISS/NOAA/BEST, are actual original measurements, and what fraction are subject to adjustments? A 2. Or as Nick Stokes put it "How widespread is the practice of doing arithmetic?" Original records may be adjusted to account for the above. More normally, though, AFAIK it is not the original records that are changed when the teams are analysing global surface temperature trends (as opposed to, say, national trends by individual agencies). Changes are made while anomalies are being calculated, not to the original records but to the record of temperature anomalies, during the process of homogenisation. (Victor Venema might have something to add about this.) How this is done varies. For gridded data used by GISS, the process is explained by Drs Hansen, Ruedy, Sato, and Lo in a 2010 paper. For HadCRUT, answers to many of the panel's questions can be found here. The process is described in Jones et al (2012) and, for sea surface temperature in Kennedy et al (2011) - part 1 and part 2. Other groups such as NASA, NOAA, and the Hadley Center either work with data that has been homogenized or they make homogenizing adjustments to the data series. In the Berkeley method station records are not adjusted up or down. Rather, stations that display unreliable data characteristics are down weighted in the construction of spatial temperature fields. Stations that show evidence of undocumented moves or instrument change (e.g. evidenced by extremely abrupt changes, either up or down) are split at the change point and treated as two separate records. As a caveat to the above, individual holders of records, like the Australian Bureau of Meteorology, do adjust temperature records when necessary. This is described here on the BoM website. Q 3. Are warming and cooling adjustments equally prevalent? A 3. No, not in all cases. The adjustments to the anomalies depends on the situation. USA: TOBS adjustments in the USA tend to make the more recent anomalies warmer on balance, as described by Victor Venema here. Elsewhere: In places where time of observation is standard, it's expected there are roughly the same number of ups and downs. Rapidly growing areas might have more downs, because of UHI adjustments. Areas where the population has stabilised might have an equal number. Land surface temperatures: Overall, the earlier land surface temperature anomalies have been adjusted upwards. Sea surface temperatures: Adjustments to the records for sea surface temperature when the method of collecting data changed, make the earlier records warmer on balance, as described here. The chart below is a comparison of raw data with adjusted data, prepared by Zeke Hausfather as reported by Victor Venema. Land surface earlier records have been adjusted down overall. Sea surface earlier records have been adjusted up overall. The net effect is that the slope of global land and sea surface temperatures is steeper in the raw data than in the adjusted data. Q 4. Are there any regions of the world where modifications appear to account for most or all of the apparent warming of recent decades? A 4 a) See Answer to 3 above. A 4 b) The Terms of Reference left out the other part of this question. See above where most or all of the apparent warming of earlier decades for the global temperature are a result of adjusting the earlier sea surface temperature records upwards. Q 5. Are the adjustment procedures clearly documented, objective, reproducible and scientifically defensible? How much statistical uncertainty is introduced with each step in homogeneity adjustments and smoothing? A 5. That's two questions. A 5 b) They all include statistical uncertainty. Q 1 From me : Why are you leaving out the satellite data? A to Q 1 From me : That is an area that is prone to errors and significant difficulties of interpretation. I refer the panel to the following. Q 2. From me: How much difference is there between the different records of surface temperature? 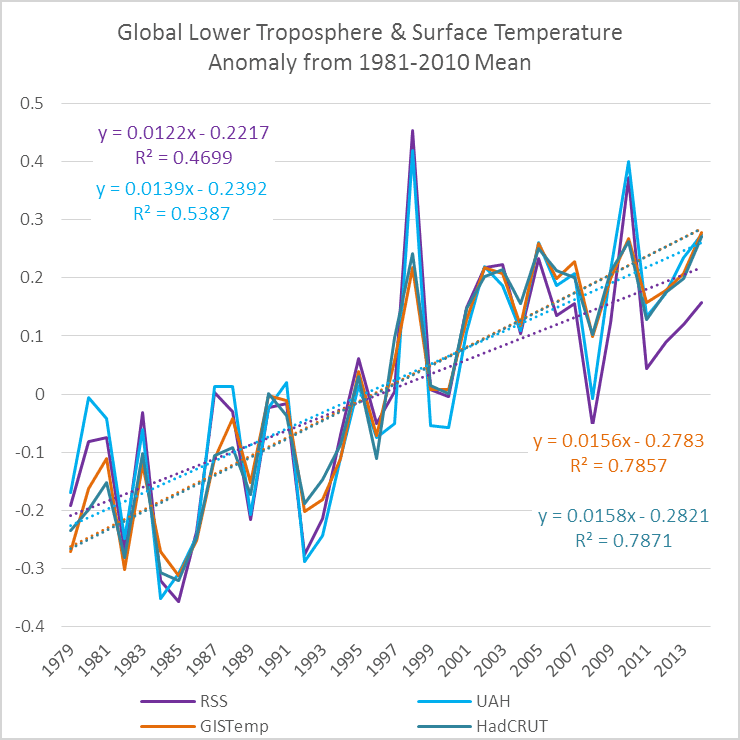 A: The panel may be interested in the following chart, which has two surface temperature records aligned to the 1981-2010 mean, and includes the lower troposphere satellite data. They line up very well. Q 3 From me: What other evidence is there that the world is warming and the climate is changing? Provide guidance to Members on methodologies, standards and software required for quality control of climate time-series, with a special focus on temperature and precipitation variables at the daily scale, but also explore existing quality controls for other variables and time-scales. Anthony Watts copied and pasted the GWPF announcement (archived here) without any comment from him. There were lots of "thoughts", many cynical. Brandon Gates puts up the charts prepared by Zeke Hausfather, showing that the raw data shows more warming than the adjusted data does. Stephen Richards made up stuff - driving data up by 3°C? WTF! It's gone up by 0.9°C since the beginning of last century, not 3C. They don’t need to concern themselves with land in or out just with the justification for driving the 20th century data up by 3°C. So, which would you rather have, the “raw” data or adjusted? The notion that SST can be accurately reconstructed via 100 year old thermometer measurements taken by throwing a bucket overboard and pulling some water up to stick the thermometer in, by sailors who kinda sorta know exaclty where they were, strikes me as unreliable to begin with. No amount of adjustment can compensate for the data being at best spotty in the first place. This investigation will be useless. No matter the outcome the truth is that we have only 30 years of truly reliable temperature records. Get back to me in 100 years. FWIW, I am not only skeptical, I do not see any evidence for warming, man-made or otherwise. In fact, call me a Denier. I have no problem with that adjective. “I have no problem with that adjective.” Yes, you do – it’s a noun, not an adjective. Stevek blames NOAA and NASA and Michael Mann and Phil Jones for the rise in the cost of his electricity. That's probably all the names he can think of in relation to climate. Is it possible to sue noaa or nasa because our utility bills have gone up due to a policy that was based on fraudulent data ? Class action lawsuit naming jones,Mann,nasa,noaa etc ? Nothing but another layer of varnish to desperately try and lend some credibility to the claims. The most strange and unexpected thing to come from reanalysis of 20th century climate would be to find that climate had been static. It is a dissipative chaotic and under a multitude of periodic forcings. It oscillates fractall on all times and on all scales. Always has and always will. Why should the 20th century have been any different? Jimmy Finley is hopeful that the data reported is correct. He doesn't want the world to cool. This is a timely study. Given Anthony et al. work on US stations, the good ones are flat or cooling. The compromised ones (airports, parking lots, etc.) are warming and they – here and elsewhere – get spread all over the globe to give us great globs of red on maps. If these compromised stations altogether are giving us no warming over the last nearly two decades, what is the real story? Are we seeing actually declining temperatures? Would we even know if we were starting the nosedive into the next glaciation? Let’s get a rigorous look at it; no more BS. Warming we can stand, and perhaps benefit significantly from it. Cooling is death. Even if all this data was all accurate to 0.02 C it would not make any difference. The major problem, historically, is there is not enough data, particularly ocean data. The key advantage of satellite data is the global coverage. Does B not know that the earth is warming? Good luck with that inquiry. ATTP asks - how many times must we do this? And there are more references up above. The scientists chosen by the GWPF are well qualified to review the data sets but they will have to explain themselves at all stages if they want to poke holes. If Roger Sr et al want to undermine the math they'll need spectacular reasons. Roger Jr has realised that tenure is not automatic at very good joints like Boulder and Im sure Roger Snr has taken that on board too. Standards matter. Victor's review is coincidental but the fucknukles at the GWPF will probably view it as a conspiracy. PG - I'd agree that the scientists on the review panel have the skills and quals required to do such a review but I doubt they have what it takes. They have a huge handicap. Their history suggests they aren't as well qualified as would be expected for an independent review. They'd have to take off their ideological blinkers first. The chair is said to be a fake sceptic and is on the GWPF academic advisory council; and listed on the Cato website. Roger Pielke Sr has a track record in regard to spreading nonsense about climate. Petr Chylek is a denier who rejects the greenhouse effect, going by this. Richard McNider is cut from the same cloth as John Christy and Roy Spencer. He works with them, too. And he pushes their same nonsense. Roman Mureika is a denier who hangs out with Steve McIntyre. He's been known to be wrong, such as when he sided with Nic Lewis in his wrong criticism of Marotzke & Forster (2015, Nature) - but probably not inclined to admit it. William van Wijngaarden - I don't know about him. Maybe he's still on training wheels in regard to ideological climate reviews. Oh great another rogues gallery. Then the WMO is pretty omniscient. That this task team was build was decided over a year ago. International organizations are not known for their speed, which is probably a good thing because getting visa is not easy for everyone. Victor, call me an old conspiratorialist but is it possible that one of those surface temp reviews is being being mounted to preempt the other? PG, I do not think so. We will just produce a boring report with lots of details and references. Useful for weather services, but not relevant for the climate "debate". I do not think that the Policy Foundation or any other think tank feared our report. It is not like the Pope telling the Christians at WUWT that they do not understand the gospel and that almost all Christians outside of the USA disapprove of how they treat the creation that God gave them. The distorted version of your report we will read about courtesy of WUWT will be far from boring: I look forward to the "Scientists Admit Fiddling Temperatures" headline. Agreed Sou but not all of them are likely to do a Jennifer Morrissey all over the data and escape with their reputations intact . Remember Dr Curry still had considerable standing before she pulled the cloak of scientific invisibility over her bonce at Berkeley in 2011 and now she's reduced to citing herself on Breitbart, the WSJ, National Review, The Australian, The Daily Caller and The Daily Mail. Pielke Sr knows that every syllable he utters from here on in will be ruthlessly examined. I'm surprised he accepted the invitation, it can only end badly for him. Dr Jennifer Marohasy? Oh man, I saw the video of her on the ABC Q&A that time, Tim Flannery was looking at her sideways. Can I be cynical and say a retainer may be involved? Or at least they have taken up a career as a part-time pundit. I hope you can fill us in on who the "climate scientists" are who the Heartland is sending to Rome and what they have to say. I always have a good laugh whenever they publicize their claims of scientific credibility. Denis it's being led by that career liar Marc Morano. He has no scientific qualifications whatsoever. Once one acknowledges the fact that Barbra Streisand has perpetrated the greatest hoax in the history of history, this all makes perfect sense. Actually Morono specialized in BS of political science. You'll have to go to the live page to see the evolution of the fracas up to the point that I got sent to the corner. I don't think Anthony liked you bringing up your generous offer regarding Steve/Tony's FOIA request. I thought that might be it, but he left other references to it in ... at least last I checked. I also made it clear that the offer is still open. I should have archived page as soon as I noticed his moderation note. The other thing I hope he's needled about is that I have at least twice mentioned that his initial promise to accept BEST's findings as valid no matter what ... which obviously did not happen. Some classic comments there Brandon. You walked the line of sticking to the facts without throwing direct insults. That should work on any comment board, but I'm surprised Anthony let it go on that long, lol. Thank you Joe. That kind of feedback keeps me going for whatever it's worth other than my own personal satisfaction, which does at time wane. Speaking of, I'm back in and right back at it. I must say, it would appear as though the Heartland delegation failed in their mission. Perhaps they couldn't see the Vatican from their room? I have this vision where the Heartland delegates manage to get an audience with the Pope, and in front of live TV cameras he says "gentlemen, you are sinning against humanity and God's Creation. You will all spend eternity in Hell. Be gone". One (or at least I) wonders what effect such a pronouncement would have on the Venial Viscount, who professes to be a Catholic. Would it bother him? Of course the Pope, being truly pastoral and RC, would provide the opportunity of repentance and penance, which might be very interesting. Bernard (1:29) … But it would make a fantastic cartoon. Come to think. of a cartoon of a dialogue between the pope and Lord V. Viscount could make for a few good belly laughs too. The Viscount is such a polymath the deniers should enthrone him as antipope. I'd suggest the papal name 'Charles David Rex' and a new papal palace to be erected in Houston Texas - Avignon is too touristy these days. Todays Scientific American article, on the Pope's climate change conference, included a quote from Steve Moore, economist at the Heritage Foundation, wherein he claimed that the Pope was aligning himself with the "far left". I left a few comments about the conservative think tank denier PR machine. Don't they get tired of reality having a liberal bias? ...aligning himself with the far left, like those famous Communists, Benedict XVI and John Paul II. DeSmog UK has the photos of The Heritage Foundation's triumph at the Vatican (well maybe not the vatican but it's only 5 metro stops away from it). Professor van Wijngaarden is a physicist who works at the University of York in Ontario, Canada. As well as researching quantum information and laser spectroscopy, he has published a substantial body of work in climatology, focusing particularly on inhomogeneities in the data records. Where is that "substantial body of work in climatology"? Show me the data. And unlike climate risk denier who will then wait for someone to bring them the data, I found it myself on Van Wijngaarden's website. Looking at his latest paper, I wondered why he would let himself be used as a GWPF banker lackey, but the conclusion is full of the usual climate risk denier memes, albeit weasely worded. If I've counted correctly, Van Wijngaarden (co-)wrote 9 papers, all of them dealing with humidity and SAT changes over Canada (5 papers), N-America (2 papers), the US (1 paper), the Arctic (1 paper). There's not much variation in the subject. It seems that he went overboard since 2014, based on my reading of the conclusions of his 3 papers since then. The introductions are pretty basic, but all the FUD action is in the conclusions. How this can slip past the reviewers and editors of Theoretical & Applied Climatology so easily is anyone's guess. Rumour has it that the editor of Theoretical & Applied Climatology said himself that you also need journals in which one can publish the work of a master theses. If you go even lower, you get to the predatory journals. Nick Stokes has made a submission to the GWPF inquiry into commie thermometers. Well, I've posted a draft - comments invited. Richard S. Courtney on WUWT comments tells me he is putting in a submission as well. I did follow his link, but all I found was his 2010 submission to the UK Parliament (it includes dead links). things to do than write submissions to the GWPF. PG: Human to human I have some sympathies for his ill health. His soul sickness, absolutely none. Quite the opposite. Harry Twinotter: can I just say it has been a pleasure watching you work that thread? BTW Brandon what's happened to Jimbo? Huh. Good question. He's been active within at least a month, maybe two, but you're right, he's gone totally dark. I've no idea why. I didn't previously because I considered WUWT a freak show. But some of the articles were getting so outrageous I thought I would have a try at talking sense into someone. I am only really interested in responding to the author of the article. Richard S Courtney I did not go after specifically - he kept commenting on my comments. A freak show, yes, but a highly-trafficked one. I try to keep in mind that to the extent what I do is more than just for my own indulgences, that the goal is -- as Victor Venema oft reminds us -- to steer the lurkers toward reality. It takes its toll on me, especially when Anthony's main enforcers, Stealey and Courtney step in when the head post has been trashed and the lesser minions are on the ropes. It was nice for me having a friendly around on that one. Michael E. Mann shared a group. Thanks, John. I've now added your facebook page to the sidebar. we will be dependant on people of power and persuasion to mitigate GHGs. Francis is on-board. The next person of influence is Rupert Murdoch or more likely his son Lachlan. Only 6 years ago News Corp achieved carbon neutrality and for all I know it has maintained it. If the WSJ, FNC, Sky, The Sun, The Times and The Australian stop being willfully destructive and Hansen is wrong about 1C then we may be OK. I must point out that in no way am I equating Pope Francis to Rupert Murdoch. There are huge differences. The greatest being that I am not at all looking forward to Fancis' death. PG I am an atheist thanks to a pathetic attempt at indoctrination by Catholic Nuns and Christian Brothers. At the ripe old age of nine I worked out they were all insane. The only really sane brother I ever met was my science /music teacher in grade four. He gave me singing lessons at lunch time along with a lady pianist. I once arrived early for my lesson and caught them in flagrant delicto. I said nothing as I thought this is what adults did when us kids were not looking. My only data set at this time was my parents behaviour. This brother later went on to leave his vocation and marry this fine pianist. Her name was Miss Darling and this brother would take great satisfaction to call her darling in public. Much to the consternation of his fellow brothers who most probably had more nefarious habits. I have the dubious pleasure of singing solo in the Melbourne Town Hall with Miss Darling as my pianist at an eisteddfod in the late fifties. It was in the days before decent microphones and we filled the hall acoustically. Before we started I commented how adorable she looked in her new evening gown. She blushed a bit. It was years before I knew what was really going on.